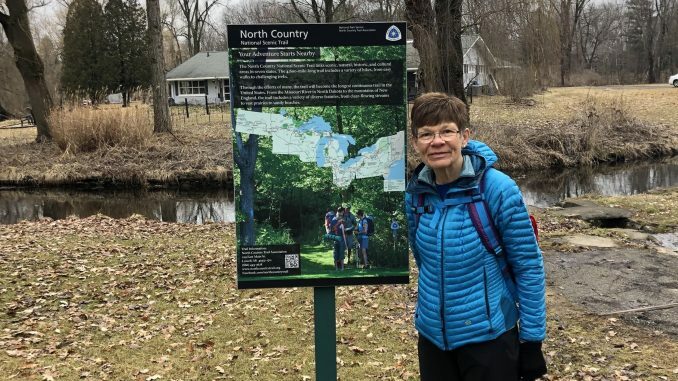 After writing an article about Albion’s new Trail Town designation, I was interested in learning more about hikers on the North Country National Scenic Trail, of which Albion’s River Trail is part. Albion was given this designation by the North Country Trail Association, showing the city’s dedication to welcoming hikers. Walking along Albion River Trail, I was joined by Jane Norton, volunteer president of the Chief Noonday Chapter of the North Country Trail Association, who spoke with me about this topic. As we walked, we were accompanied by the calls of far-off cranes. A slick breeze carried us along at pace almost too quick for me but just right for Jane. The paved path kept us on a steady route towards the cemetery where the first glimpses of spring life were began to show. Autumn VanHeulen: What is so exciting about Albion’s designation as a Trail Town? I know that it’s good for the local businesses, but what about for you? Jane Norton: We’re getting more “through hikers” because people want to do a 100-mile challenge — it’s exactly what it sounds like. A lot of Michigan people are “through hiking” Michigan. So with the Trail Town designation — that means the city knows about the trail — is supporting the trail and are friendly to trail people. Because a lot of times hikers are a little scruffy looking and maybe don’t smell perfect. People don’t always understand hiking. AV: What do you mean by “through hikers”? JN: That means they wear their house on their back. They’re spending multiple days hiking at one time. AV: Why is it important that cities like Albion support hikers on the Trail? JN: Hikers sometimes need doctors. They like to go to a library because of the Wi-Fi connection. They need groceries. They may need a motel. They can’t hike every day. Hikers generally like beer, too. So if they see there is a brewery, they want to visit that. They might also need equipment to fix tents and things like that. AV: How does the North Country Trail connect to other trails in this area? JN: So we piggyback on trails that are already there. Albion’s got the Riverwalk, Marshall has the Riverwalk, Battle Creek has a linear trail. Why build a new one when those are already there? So this trail is [part of] the Calhoun County Trail, the Albion River Trail and the Iron Belle Trail. AV: Who works on the trail? Is there a group of people who maintain it? We have 33 kiosks and we have one volunteer who is in charge of them. AV: What else do volunteers work on? JN: We rely a lot on our volunteers. Without volunteers nothing gets done. Most of our volunteers are retired people, but we can’t be working on [the trail] forever. So we want to get other generations involved in the trail and teach them how to maintain it. Sometimes groups like church groups or alumni groups from different colleges want to help work on the trail but we can’t always let people work on the trail they way they want to. It’s awful to turn down volunteer help but sometimes, for instance, trees fall down. Then we have to have a certified sawyer remove the tree from the trail with our equipment. There are only about six or seven people in our group who are certified. We have mowers that you have to know how to operate. And we have to train people on how to deal with invasive species. So we can’t let anyone just go out and start working on the trail. That’s why we want to get more people involved in the trail long-term. AV: How often do you lead hikes on this trail? JN: Well, our chapter has monthly hikes and we usually come through Albion. We’ve tried to get more people and students involved but we just don’t get a lot of people. The last two years, when we did one of the trails in the Whitehouse Nature Center, we had two or three students come, but that’s it. We would love to get more students as well. The next Chief Noonday Chapter free, guided hike is the Spring Wildflower Hike on Saturday, April 6. You can find more information here. Autumn did a great job addressing the subject with easily understood questions and interpretation of responses. Her description of the hike experience is inspiring.